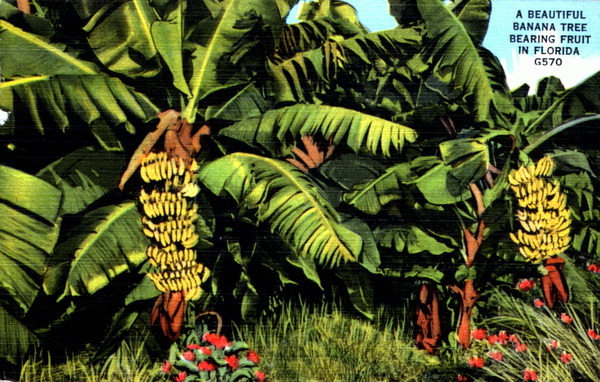 A banana tree is a metaphor for life, really… it dies after it bears fruit. It gives its life to produce the next generation. Banana leaves are so useful. Useful when they’re green, and useful when they’re brown. Generation upon generation. That really is a sacred word, generation. WE generate ideas, too. So can’t WE generate more peace, rather than more war? Can’t OUR fuel be love, not hate? Yes, just like the banana tree, sometimes destruction is necessary to create new life… recycling? Reincarnation? One way of looking at things is to take a leap of faith – decide that when WE die, nothing will be lost; everything will be gained. WE leave behind US a legacy, all of US, shaping the reality of the UNIVERSE. The UNIVERSE is alive through US! The UNIVERSE writes songs and stories and mathematics and music through US! WE are engines! WE are alive! WE are organic! WE, human beings, are evolving right this second! LIFE doesn’t stand still! LIFE adapts, or ceases! LIFE IS EVOLUTION. Trying to cling too desperately to the past is to entomb the SELF in stone, alone, buried alive, dying. WE’RE alive until WE’RE dead. Value this opportunity. Don’t throw it away. Take care of OUR home, planet Earth. Take care of OUR fellow travelers. Send not a sword, but an olive branch to OUR enemies as well as OUR friends. OUR bitterest enemy may turn out to be OUR best companion. Only time will tell. WE live within moments, WE exist within history, and WE are passionate within the spirit. Train that energy! Use passion to create, not to destroy! Destructive passion, combined with weapons of all kinds, might kill US all. Respond to life with logic AND emotion. Let US use OUR brains and OUR gut. Instead of the falling abyss of dread, the rising flutter of joy… and at the end of life, may WE all have truly, truly, truly found PEACE. The root of compassion is this: there, but for the grace of god, or the luck of the draw, go I. Treat others the way you would want to be treated, were you to wake up one morning inside their life. Let morning, and let hope, break inside your soul. For a number of reasons, I have been called away from writing, and I have missed it terribly… and I have also missed so much here on WordPress, a truly valuable (and for me, essential) community of dedicated writers and artists of every variety. When I read the work of others, listen to the work of others, see the work of others in my creative “family,” I feel the reinvigoration of my own essential spark, that soul’s brightness which I cannot live without. It is as important as air: the eternal conversation between Minds… the desire to communicate and affect one another in a very human, very tangible, and very undefinable way. Another writer told me once that the way you know you’re a writer is you HAVE to write! You cannot NOT write. You must write as you must breathe, or drink water, or eat, or sleep. If you don’t, you become wretched, fearful, at squandering the opportunity being called into this life has given to you. And we must not waste our time here. There is no sin but the giving up of hope. Without hope, we become desperate, suffering creatures indeed. I am deeply worried about the world right now. All of it. All the people, all the creatures, all the natural beauty. There is an albatross, named Wisdom, who at 64 years old is raising another chick. We have lost 70% of our seabirds on this planet. We risk losing Wisdom, and wisdom. Children are suffering from endless war. Climate change is disrupting what little stability we have managed to achieve as humans. Violence, bombs, bullets, hatred, racism, sexism, greed… let this not be our most lasting legacy. In December, Christians celebrate the birth of a man they believe came to save the world… if only it were that simple. Whatever faith or philosophy or moral compass you hold within you, realize that the saving of the world begins with each one of us. Spirit exists whether you think it’s permanent or not. The spirit of a human life can be broken. And yet, some people who have been through unimaginable horrors manage to go on and create, and experience, hope and happiness and human connections. I love you all, without conditions. Kim Davis. Pope Francis. Spirituality. Religion. Compare and contrast. I humbly speak of God to you as you may define him, or her, or them, or it… the way you, as an individual human being making important life decisions define what is good and what is bad… the way you, in your heart, define that force, that energy, that life-giving PRESENCE we have all, at some point in our lives, experienced with joy, or with wonder, or with fear, or with feeling all three of those things simultaneously. No religion carries with it a monopoly on definitions of ethical and unethical behavior! Kim Davis, professedly a “Christian,” is literally crying with joy over unilaterally discriminating against LGBT people. While at the same time she professes to love “God’s people” with all her heart & soul! 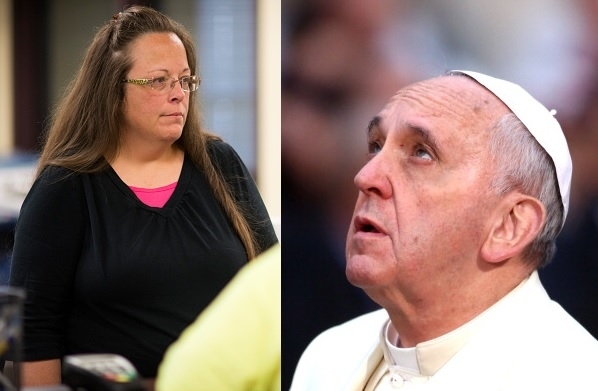 Who is Kim Davis to tell anyone, anywhere, whether they are one of “God’s people? ?” Tell me, what is the difference between Kim Davis & any other extreme religious fundamentalist — whether Zoroastrian, Hindu, Buddhist, Jew, Christian, Muslim, or Baha’i, et cetera? In my opinion, each and every religion spawns its own internal sets of believers who proclaim their personal religion to be the “true,” and therefore the “only,” religion! For example, extremely fundamentalist Buddhists sometimes enclose themselves into a tomb to starve themselves to death, after spending the previous two years eating only the most rudimentary plant matter — I’m talking bark & leaves! While they are enclosed in that living tomb, they ring a bell every morning to communicate to the world they are still alive. When the bell does not sound, the remaining monks wait a specified number of days, before opening the tomb. Then the naturally mummified (from self-imposed starvation!) human bodies are exhibited as the bodies of saints, or whatever “saints” are called by Buddhists. These scientific and cultural and literal “earthquakes” bring with them frightening shifts in the primary causes of human suffering. Shifts which must now be dealt with using something more than ancient, beautifully written, but now outdated, and therefore “mummified,” religious, doctrinal texts. Pope Francis is a good example of someone who is at the opposite end of the spectrum from an extreme, literal fundamentalist. He seems to be actually speaking out against the largest, most pressing, environmental and social evils we currently face. Kim Davis is an equally good example at the fundamentalist end of the spectrum — someone who is not, in any real sense of the word, a spiritual person. She seems to me to be simply an authoritarian, judging person who understands little about love, the human condition, our planet, the vastness of the universe, or the mysterious, ultimately unknowable nature of God. And I, for one, am already heartily sick of hearing about her.